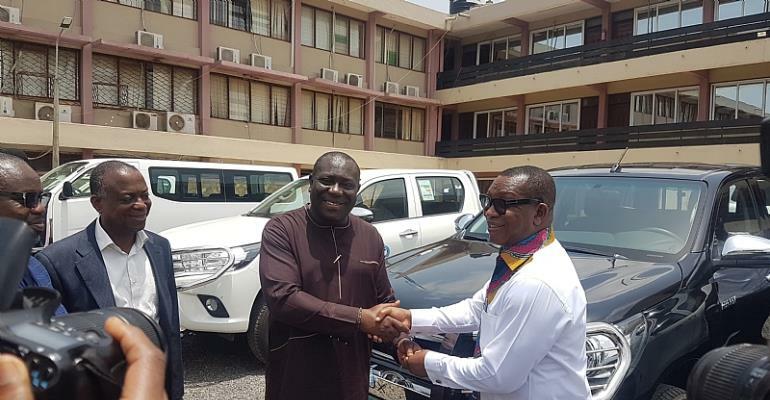 The government has donated 15 vehicles to the Ghana Meteorological Agency (GMet) to enhance its operations. The vehicles were presented to the Agency ahead of the World Meteorological Day on Saturday, March 23 in fulfillment of a pledge made by the Communications Minister, Ursula Owusu Ekuful in 2018. The vehicles include four salon cars and 11 operational vehicles. The Deputy Minister for Communications, Vincent Sowah Odotei, on behalf of the sector minister said, the support was part of government’s efforts to equip the agency with the requisite tools to become the best meteorological agency in the sub-region. He said government recognizes the important role the agency plays in the country especially in terms of gathering information about the weather and advising the general citizenry about the effects of prevailing weather conditions. He said the vehicles are expected to make mobility easy for the agency and ultimately help them discharge their operations diligently. “We expect that you take very good care of it and make sure that the proverbial maintenance culture is ensured and as you are aware, you use it to provide efficient services,” he said. The Director General of the Ghana Meteorological Agency, Dr. Michael Tanu expressed his appreciation to the government and the ministry for the intervention. He commended the government for showing avid in the activities of the agency and prioritizing efforts to equip the agency with the necessary tools to help it improve upon the quality of its work. “We thank the government for giving us these vehicles. They are going to help us to do our work properly by making sure that there is data available for analysis and be able to make sure that our equipment are working effectively,” Dr. Tanu said. He also promised the Deputy Minister that the vehicles will be put to good use.